Photo: A local masquerade group performs for the children at last year’s children’s Christmas party in Tabernacle. Basseterre, St. Kitts – Hundreds of children residing in Constituency No. 7 (Belle Vue to Ottley’s Village) will have another reason to smile this season when Prime Minister and Parliamentary Representative the Honourable Dr. Timothy Harris hosts his annual children’s Christmas parties starting this weekend. The annual Christmas parties, which have long been a staple on Harris’ annual calendar of community outreach activities, will feature musical entertainment, appearances by local masquerade groups, and lots of food, drinks and gifts for the children. The festivities kick off Saturday, Dec. 16, with parties being held at the Ottley’s Village Hardcourt for children living in Ottley’s and Lodge Project, the Phillip’s Village Hardcourt for those living in the Phillip’s area, and at the Band House in Lodge Village. Sunday, Dec. 17, is reserved for the children of Christ Church and Belle Vue. The event in Christ Church will be held at Shanice Residence, while the children residing at Belle Vue will enjoy an afternoon of fun at the tourist hotspot Black Rocks. 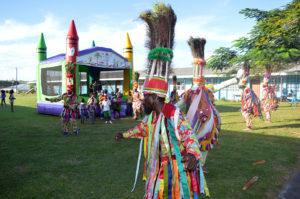 The final round of Christmas parties is scheduled for Tuesday, Dec. 19, when children of Tabernacle will gather at the Edgar T. Morris Primary School for their Christmas party; those living in Mansion will have their function at the Estridge Primary School; while the children of Molineux will meet at the Edgar Gilbert Sporting Complex for the Christmas party in their honour. All children’s Christmas parties will run from 2-6 p.m.
Prime Minister Harris urges parents and guardians to take note of the respective days and locations and encourages them to ensure their children come out to partake in the festivities.